The weakest link in the hardware chain of a notebook is always the harddisk. What do you really have from dual core processors and gigabytes of RAM when most of the time you have to wait for I/O? Over the time my notebook got steadily slower and the harddisk was running and running. I tried cleaning up the harddisk and followed several advises, all with just small success. It must be remembered that I’m primarily working on Java software development with Eclipse, where it is natural that you have thousands of small files to load and to write. These files cannot be read in one flow, and handling lots of small files is much slower than handling larger files. Now the notebook got so slow that I was really badly annoyed and finally decided to ask our admin whether I could get a SSD for my Mac. I hoped this will reduce the performance bottleneck and help me work more efficient again. Today our supplier got this disc and I immediately went to them to exchange the disk. Just made a backup and some benchmarks before the change. Now I have all working again and getting my first impressions. What I just can say is: Go get an SSD! The difference is amazing! The complete results can be downloaded and viewed with Xbench: Before After. The benchmarks clearly show that I/O has boosted performance by factors. Really extraordinary is the comparison of writing (10x) and reading (26x) randomly small files, which comes close to the behavior that you have when working with Eclipse and larger projects. 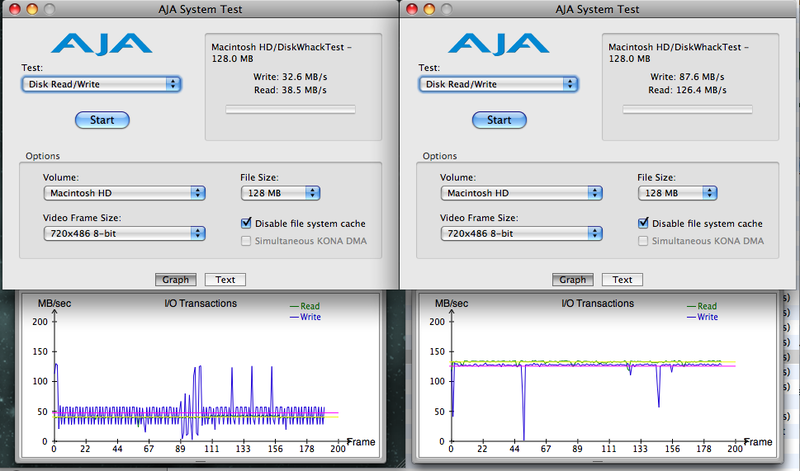 But even in other categories it is clear that the SSD beats the old HD clearly. What the benchmarks already show I can share with my subjective feeling when working with the new hardware. It is now as if I would have a completely other system. Startup of the system and applications is now really fast. To give you an imagination: Open Office (yes, I use it from time to time, don’t sent me comments on that!) starts now up in 2 seconds! I did not measure it before, but guess it would be about 10-15 seconds before. iTunes takes less than 2 seconds to start. And Eclipse starts up I would say about 4 times faster. When I think about how many time got lost for me just for waiting for I/O before… And finally it prolonged the time that I will use my MacBook, since now again I don’t have the feeling that I need to upgrade to a newer generation. Otherwise I think this year I would have asked itemis to buy a new one. In a few years I think most notebooks will have SSDs. Besides they are much faster they also consume less energy and thus don’t heat up the notebook that much, are more robust, and are silent. It’s just that SSDs are rather expensive now and have a limited lifetime. Anyway, I believe that the SSD is its investment really worth! So I downloaded the “Universal Subversion 1.6.3 Binaries for MAC OS X (32 and 64 bit)” package from CollabNet.